I love helping others. I especially love helping others without them asking for it. It fills me with joy to take the initiative and choose to make a difference. Whether I surprise someone with a smile, or simply give because it feels like the human thing to do, many times my soul feels called to be a part of a change that another person wishes to create. Sometimes I make an $18 donation to a bike ride or race, sometimes it’s reaching out to offer support because I feel when an individual need extra TLC. For others, it means spreading their word of a mission or passion while even better, connecting them together with a friend working towards the same end result. It’s all about intention and my intention is always: LOVE. This brings me to an email I received this morning from my friend, Russ Bates. Russ & I met in 2009 at the MS 50 Mile Challenge Walk in San Diego, CA. This 3 day event raises money and awareness for Multiple Sclerosis. MS is near and dear to me due to my own diagnosis in 1998 and for all the incredible friends I’ve made over the years (my strangers to friends, my silver lining) that either themselves live with it or fight to help on behalf of a loved one. Russ was a member of the Crew Team. He assisted setting up the course, delivering luggage, water, all the behind the scene work that made the weekend possible. You see, Russ’s wife, Nancy, was diagnosed with Primary Progressive MS in 1994 and passed away in April, 2006. He participated in 8 Challenge Walks to support her. Nancy went from a lively young woman to being bed ridden, but never lost her strong will and positive attitude. She never let MS get the best of her. Every year she rocked her smile and cheered on the walkers along the route. It was knowing their story, his love & commitment to the cause, even after her death, that called my spirit to support him. “When you first meet someone you never know how they are going to affect your life. Such was my initial introduction to Carlyn Shaw. We knew of each other from a previous event in which we had both participated, but were officially introduced at an organizational meeting for San Diegoâ€™s Annual 50 Mile Challenge Walk for MS in 2009. I was smitten with her effervescent positive attitude toward life, even in the face of having a potentially debilitating disease from which (as for now) has no definite cure. That years walk turned out to be very special for me as it turned out to be my last, after 8 years of participation. Carlynâ€™s enthusiasm for life was on display all that weekend as her team of walkers provided humor, fun and friendship for everyone. Later that year I moved away from CA and lost touch with Carlyn. We reconnected on Facebook in 2011 as she was traveling across the country, on what I jokingly called her â€œStranger into Friends, USA tourâ€. We have not seen each other since our walk days, but we do maintain communication on FB to this day. Her various posts are always uplifting and positive, even as she deals with her own daily trials. Over the last 3 years my health has had several major downturns (a stroke & 2 heart attacks) yet Carlyn has continued to post messages on FB that lift me up and always make me feel better about myself and my situation. After my most recent heart attack this past month (June), I realized how lucky I was to still be alive. Immediately I felt the need to go see my family (my Mom and Sisters in CA and my Daughter in Seattle). I had a fear that I may never get another chance to see them. Choosing to share his page with others made complete sense at the time of sending. 2) Money is tight for me right now. I knew that alone I could not fund his trip. The idea literally popped into my head that I had a chance to REALLY make a difference if I shared his story rather than simply donate $20. And, usually I simply donate. But good thing I listened to my intuition… because it was right! My awesome friends/family together donated $510– FAR MORE THAN I EVER IMAGINED! – for their own reasons, Portia, Rabiah and My Mom, Susie, chose to carry the torch and keep the ripple in motion. I love them so much for their selflessness. I can’t begin to describe the pride I felt in their contribution, knowing they were touched by his story and my effort to support him. AND…I’m thrilled to say not only did he accomplish his goal but his flights are booked and he will leave from Kansas to see his family very soon. 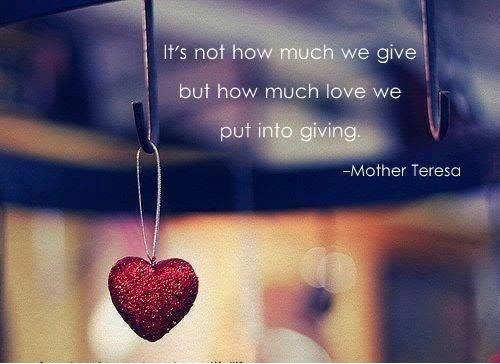 Today I challenge you to think how your giving is being received. How will YOU create a ripple effect? I’ve shown that it doesn’t take money to make a difference. Sometimes it’s a matter of stepping up when you feel called to do so. Not being afraid to stand out for someone else. If your intention is to spread love & light, I promise you, that love & light will be received. Sometimes from strangers meant to be friends.